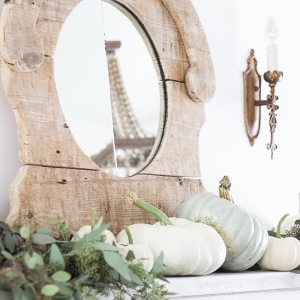 These chalk paint pumpkins will add vintage charm to your fall decor this season. 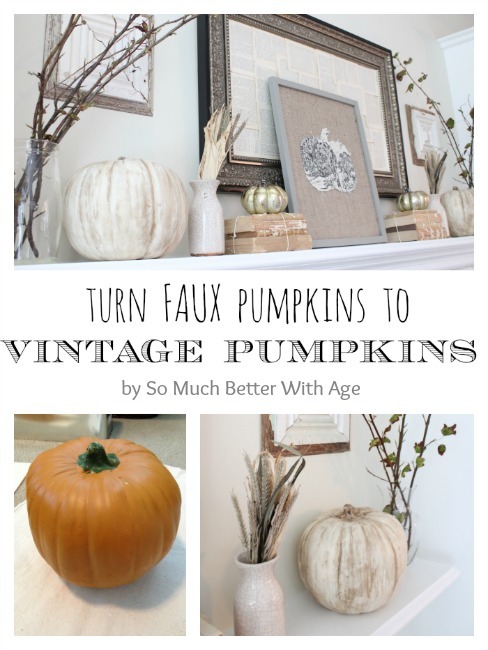 I love neutral colors and traditional fall colors don’t match my house decor so I took foam or faux pumpkins and made them into vintage pumpkins using the power of paint. 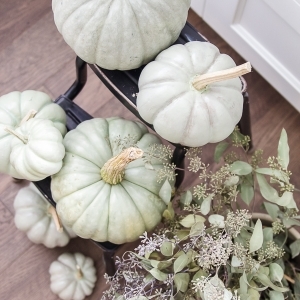 You might have noticed these pumpkins in my Fall Home Tour last week. I love them and they are so easy to paint. 1. 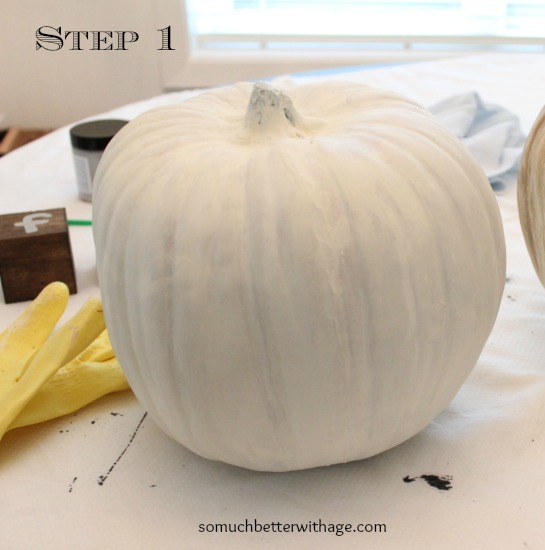 Paint pumpkins with chalk paint. Let dry at least one hour. 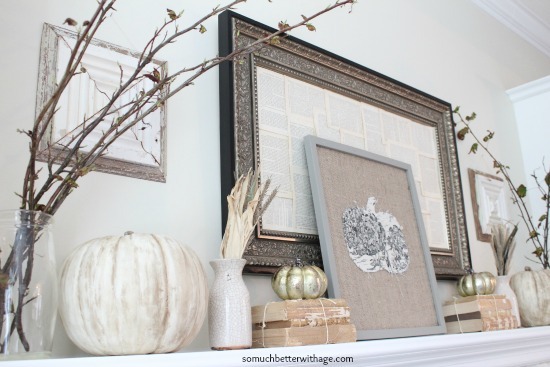 With chalk paint, you eliminate the primer step. 2. 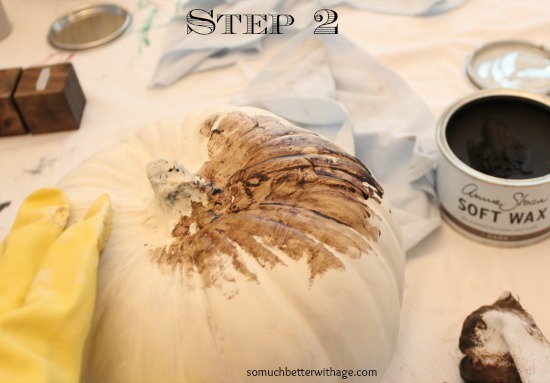 Apply clear furniture wax with a rag over entire pumpkin then apply the dark wax with a rag over top making sure to get into all the grooves. By adding the clear wax first, you’re able to manipulate the dark wax where you want. If you just added dark wax, it would get very dark and you wouldn’t be able to remove it. The clear wax allows you to take off the dark wax easily. 3. Buff off dark wax with a rag dipped in clear wax if you’ve added too much. If you want to have more dark wax removed, apply more. Continue to rub in and buff off to get the look you want. You can see I took off quite a bit of the Dark Wax so that it’s mostly only left in the grooves and around the stem at the top. 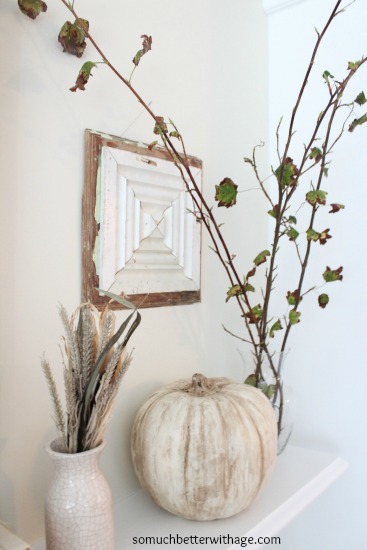 I love these vintage chalk paint pumpkins, don’t you? The best part is that you don’t need to throw it away at the end of the season and can keep them around for many years to enjoy. 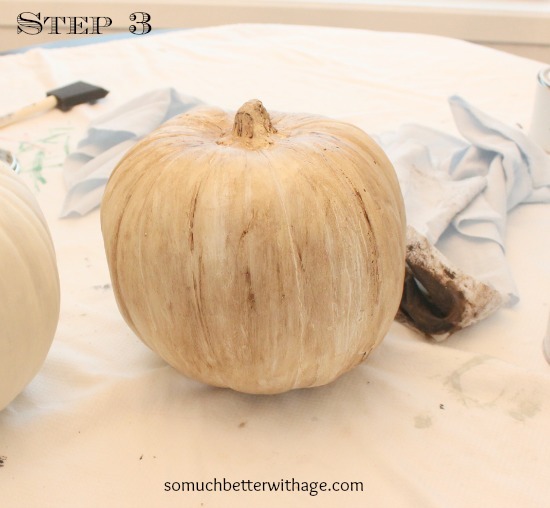 I hope you enjoyed this tutorial on how to paint your own vintage chalk paint pumpkins. 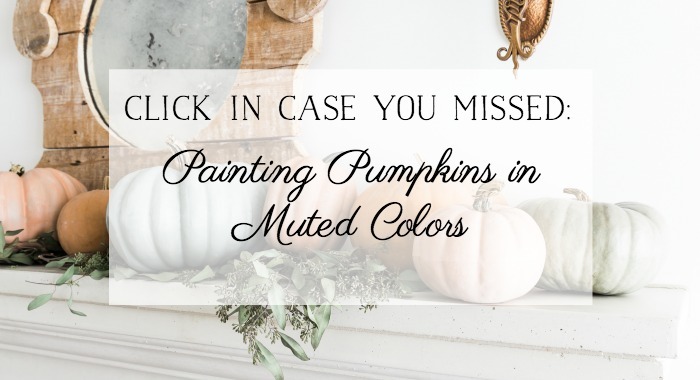 If you’d like to download my free PDF on Painting Pumpkins in Muted Colors, be sure to sign up for my newsletter below. 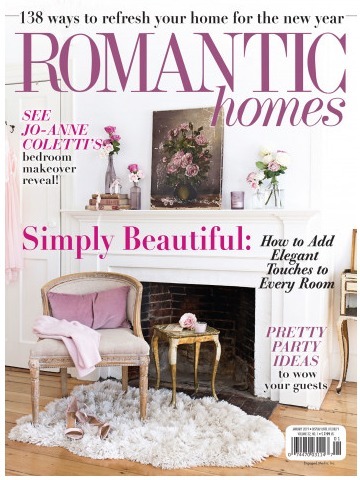 Subscribe & receive a free PDF! Success! Now check your email to confirm your subscription. All you need to do is click the link shown in the email. Thanks for your sweet comment, Lusine! 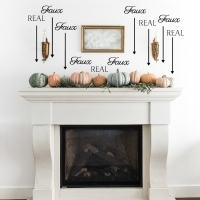 I have those EXACT pumpkins and that exact chalk paint and wax. 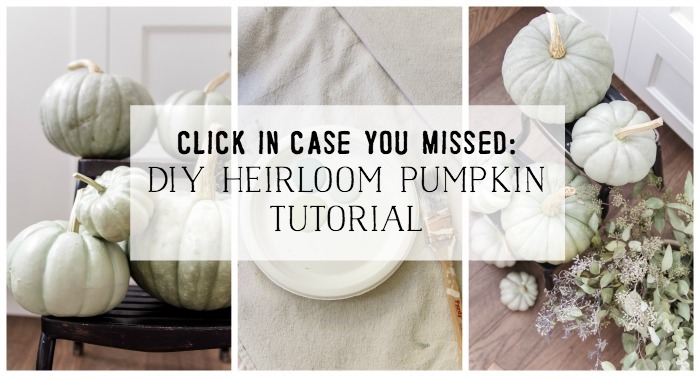 I may just have to give this a try – it turned out beautifully! 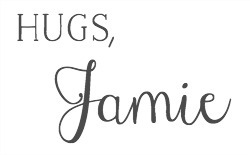 These are awesome, Jamie! I would have never even dreamed of something like this! 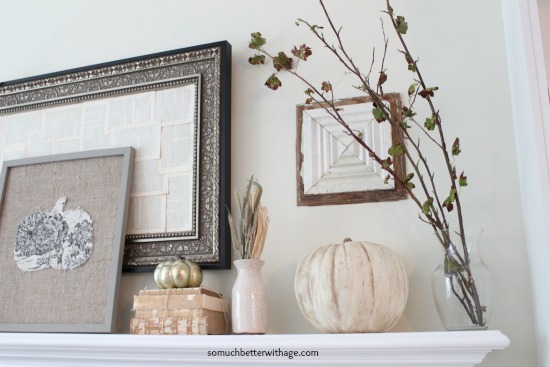 Love, love, love them and they fit in perfectly in your house! These turned out so great! AND SO YOU!!! Great job! So simple, and looks amazing! 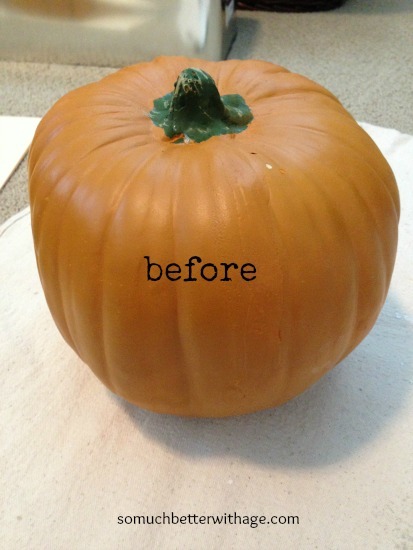 Love that you took chalk paint to your pumpkins! Adding that wax totally gives it that vintage look we all love so much. Another homerun from Jamie! Ow, ow! These are perfect, Jamie!! Exactly your style and adorable! 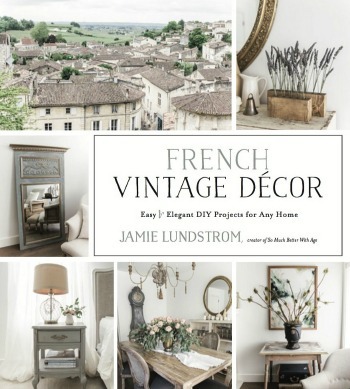 Pinning and featuring on Facebook! It looks awesome Jamie! I need to go out and buy some more dark wax. I just ran out. Thanks Pamela! I just started using Dark Wax and I’m in love! 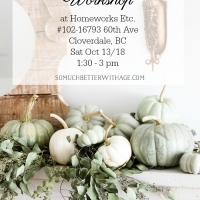 Love the look of your pumpkins! I haven’t jumped in yet to the whole chalk paint thing but I am getting close! Visiting from Nifty Thrifty Tuesday! We are having a party and it won’t be the same without your creativity! I am sooooooooo going to do this!!!!!! That is so stinkin’ cute! 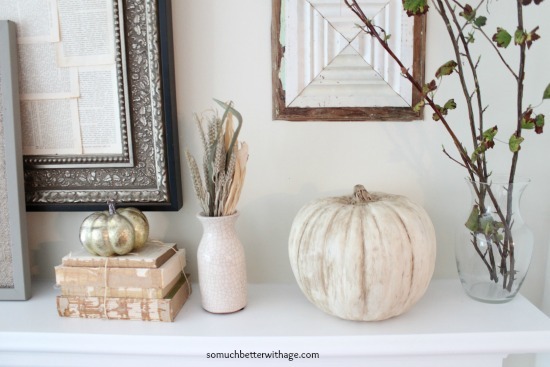 I’m featuring your pumpkin in this week’s Power of Paint Party Spotlight. These look awesome. 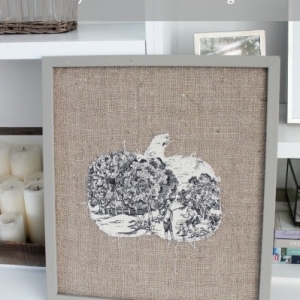 What a great idea to use the chalk paint! Thanks for sharing at the Pinworthy Projects Party! Oh I’m so glad! Congratulations!! So beautiful Jaime! 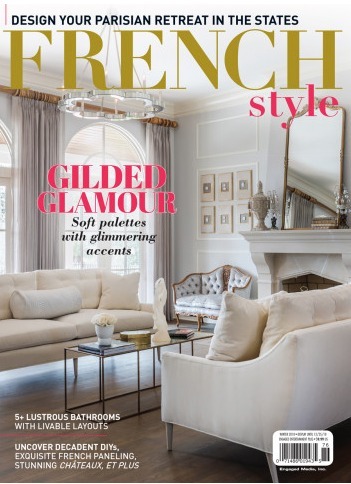 I love their neutral makeover! Pinning!